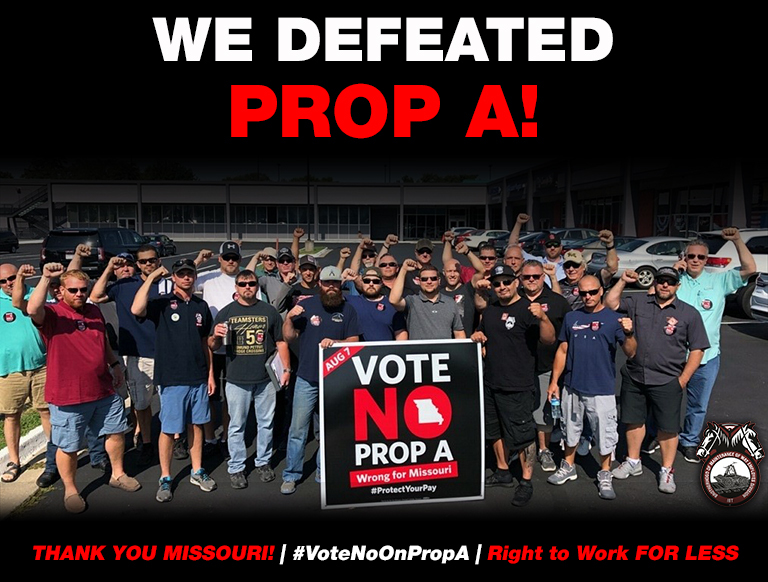 Voters in Missouri delivered a strong defeat to Proposition A Tuesday, a scab bill designed by corporate fat cats intended to defund unions and decrease worker wages and benefits. Missouri voters, by a 2-to-1 margin, crushed the bogusly-called “right-to-work” law, because the majority of people in the state saw through the company greed. BMWED members joined the fight, volunteering their time – along with thousands of other Union members from the Teamsters, the AFL-CIO, IBEW, CWA, AFT, SEIU, and countless others – to canvass voters throughout Missouri. They knocked on strangers’ doors, explained the worthless proposal, and asked the people of Missouri to vote against it. They talked to voters they often did not know, and because the Union brothers and sisters were informed and because they were authentic, they were convincing. Prop A “right-to-work” is dead in the Show-Me State. Missouri’s RTW legislation was initially signed into law by now-former governor, Eric Greitens. A Republican backed by the Koch brothers and various “dark money” groups, Greitens served only 16 months as governor before resigning earlier this year amid a series of scandals. The RTW law was supposed to take effect last August, but a coalition of labor groups gathered 310,567 hand-written petition signatures to block its implementation and force a statewide referendum on the legislation—Prop A.